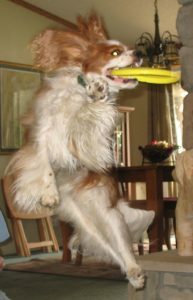 I’ve been learning how to catch a dog Frisbee, or as some say, a “dog disc,” for some time now. I’m still learning, but I am starting to get the hang of it! I typically use two different discs for my training. This is me practicing with my Jawz HyperFlex Pup Disc. What is really nice about this dog Frisbee is that it is just the perfect size for me, is extra soft and flexible for puppy or elderly dog teeth, and it’s approved for competition! Cons: Not to be used as a chew toy. Is your dog a disc dog? Tell me in the comments. Here are a few of Hyperflite Jawz Discs. They come in a variety of sizes and strengths.